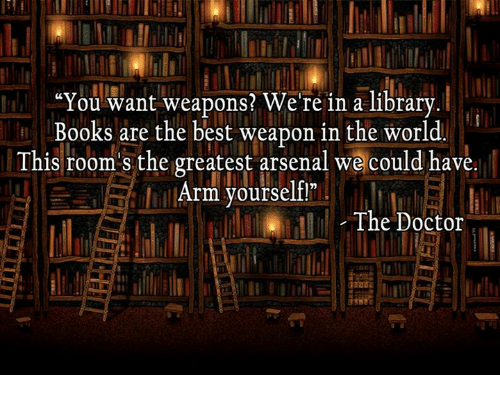 A list of some of my favorite quotes from "Doctor Who." 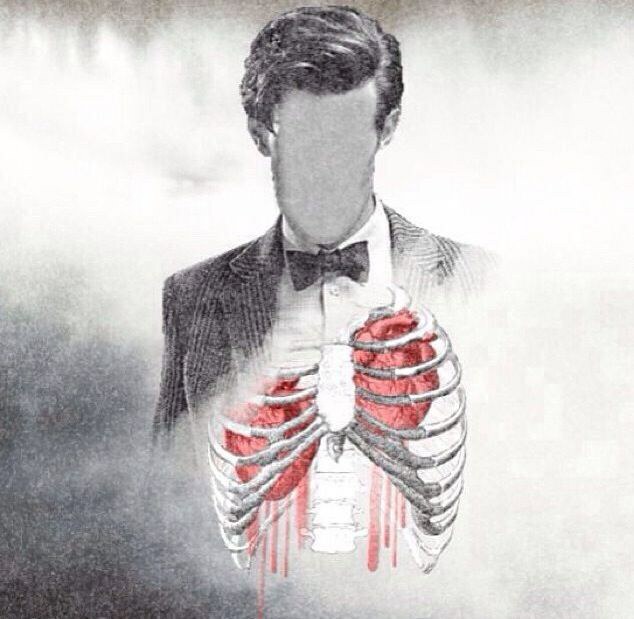 In my last article, I told you all how "Doctor Who" is much more than just my favorite show. I explained how it changed my life in many ways. I also mentioned how there are many inspirational quotes that I love. In honor of the new season premiering Saturday, April 15, around the world, I wanted to share a few of these quotes. 1. "The universe is big, it's vast and complicated, and ridiculous and sometimes, very rarely, impossible things just happen and we call them miracles." From Season 5, Episode 12 - "The Pandorica Opens"
This is one of my all-time favorites. It reminds me that the impossible can happen and that the universe is so much bigger than me. 2. 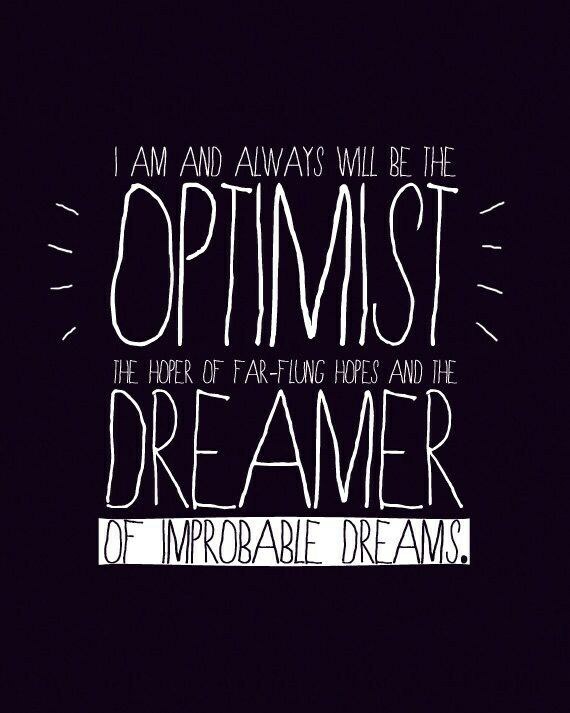 "I am and always will be the optimist. The hoper of far-flung hopes and the dreamer of improbable dreams." From Season 6, Episode 6 - "The Almost People"
This quote reminds me to look for the good in life and to never stop dreaming. From Season 2 - "The Christmas Invasion"
This scene is what made me really love this show. Until this point I loved it, but I was sad there was a new Doctor. 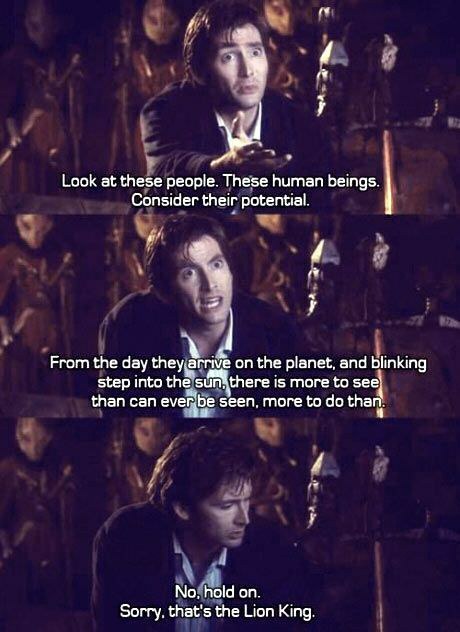 When Ten said this, I laughed and knew right then that I was hooked and would forever love him and "Doctor Who." 4. "What's the point in two hearts if you can't be a bit forgiving now and then?" From Season 6, Episode 2 - "Day of the Moon"
I try to live a life of forgiveness, and this reminds me we need to forgive even our worst enemies. 5. 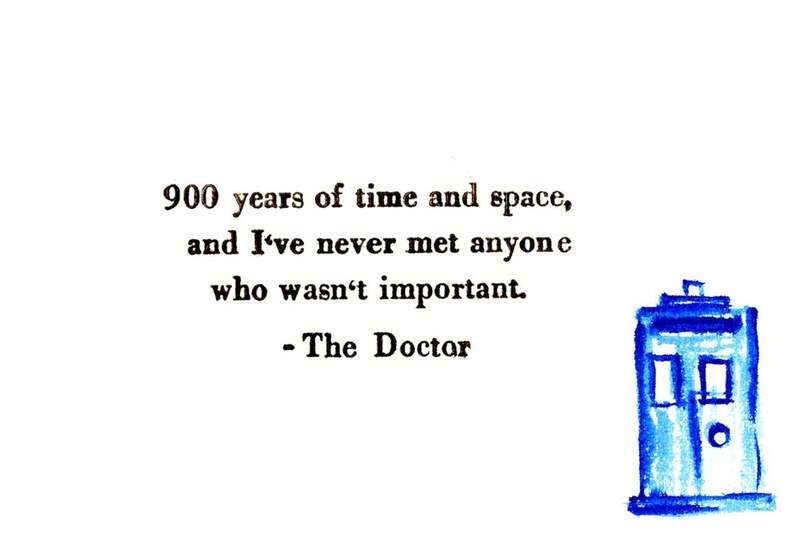 "You know that in 900 years in time and space I've never met anyone who wasn't important before." From Season 6 - "A Christmas Carol"
When I started this show, I was in a dark place with very low self-worth. 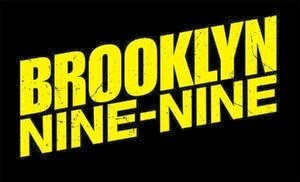 This show helped me to see that everyone is important. 6. "You want weapons? We're in a library! Books! Best weapons in the world!" From Season 2, Episode 2 - "Tooth and Claw"
I became an avid reader around the same time as I started this show. I love this quote and how it illustrates that knowledge is the most powerful thing in the universe. 7. 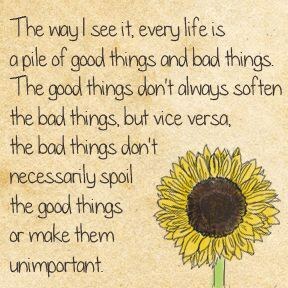 "The way I see it every life is a pile of good things and bad things. The good things don't always soften the bad things, but vice-versa, the bad things don't necessarily spoil the good things or make them unimportant." From Season 5, Episode 10 - "Vincent and the Doctor"
This is in my top three favorites. It's an excellent one to remember when life isn't going exactly how you planned. 8. "Bit of a hermit." "A hermit? With friends" "Hermits United. We meet up every 10 years, swap stories about caves. It's good fun... for a hermit." From Season 3, Episode 11 - "Utopia"
This one just cracks me up. I love it! 9. 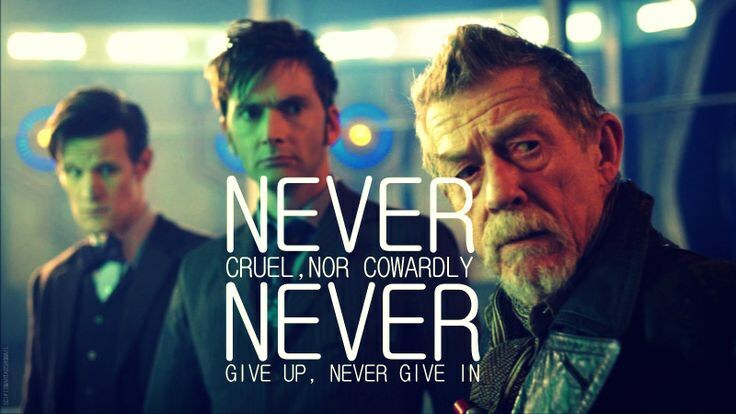 "Never cruel or cowardly. Never give up, never give in." 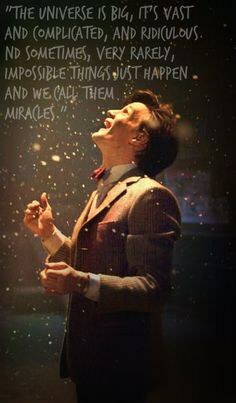 From the 50th anniversary special - "The Day of the Doctor"
This one is pretty self-explanatory, but I really love that it is his motto. It's something we should all live by. 10. 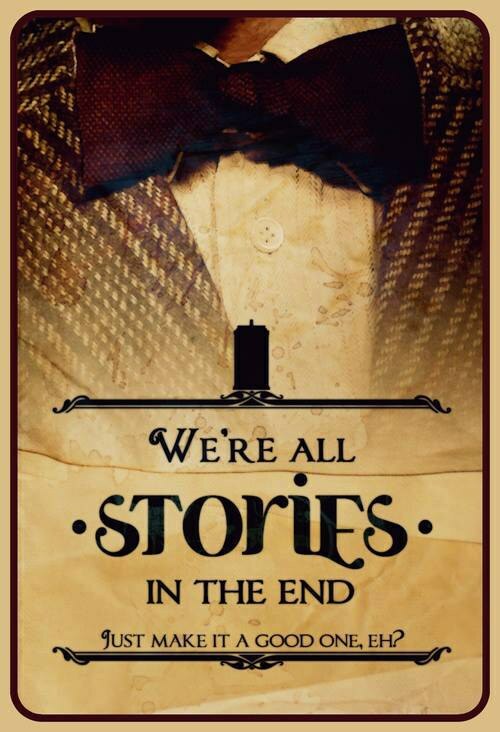 "We're all stories in the end. Just make it a good one, eh?" From Season 5, Episode 13 - "The Big Bang"
This is my all-time favorite. I've tried to adapt it to my own life by living in a way that will mean something in the end. 11. "Some people live more in twenty years than others do in eighty. 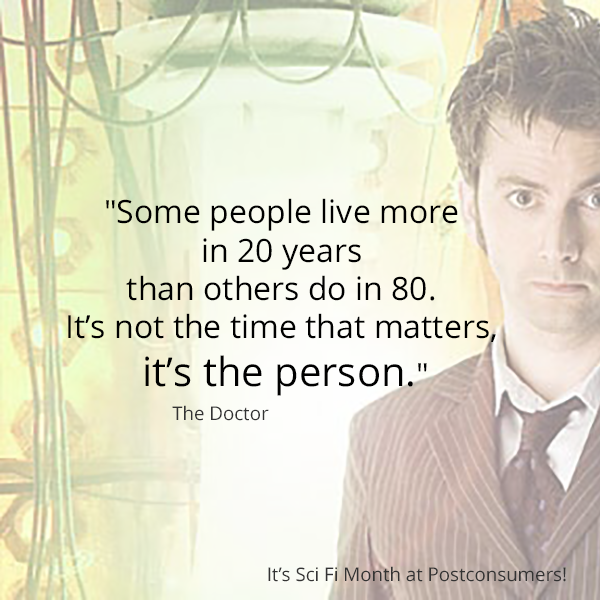 It's not the time that matters, it's the person." From Season 3, Episode 6 - "The Lazarus Project"
It's not about the time, it's about what you do with that time. Make every moment count. 12. 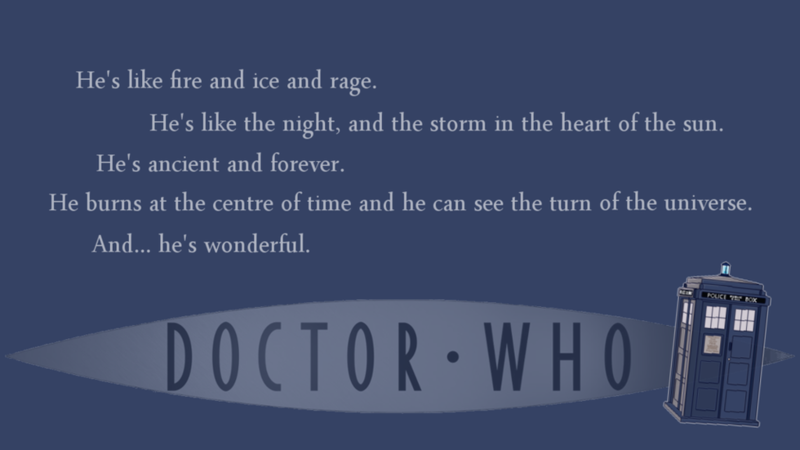 "He's like fire and ice. He's like the night and the storm in the heart of the sun. He's ancient and forever. He burns at the center of time and he can see the turn of the universe. And... he's wonderful." From Season 3, Episode 9 - "The Family of Blood"
I picked this one to end my list because it perfectly sums up all that the Doctor is. 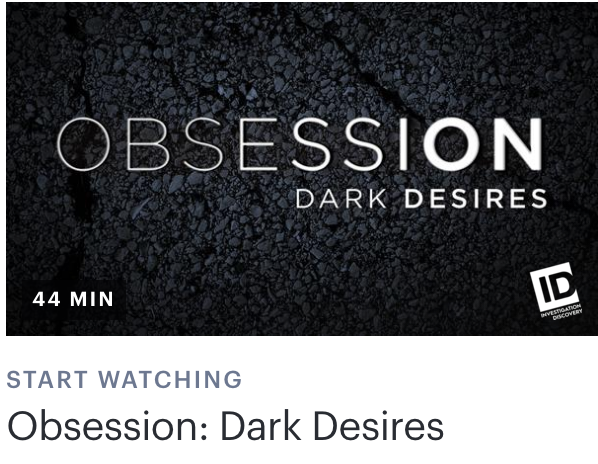 It is also a good explanation of the show because, as I mentioned in the other article, it is a constant roller coaster. It rips your heart out and shatters it into a million pieces... but it's wonderful, and you wouldn't have it any other way.